I’ve tried a few times to make sourdough bread, with a little success, but mostly failure. Previous results were patchy, resulting in a very heavy bread lacking the big, yeasty holes characteristic of a good sourdough loaf. Either that, or the starter never really got off the ground, turning into a grey, foul sludge. My previous starters have consisted of flour, water and yeasts ‘caught’ from the air – the classical way to start a sourdough is to allow airborne yeasts to colonise a flour and water mixture, then feed them up into a frothing mass. Maybe there just isn’t enough yeast around here. This time I’m taking a different approach, giving the starter a slight nudge in the right direction. 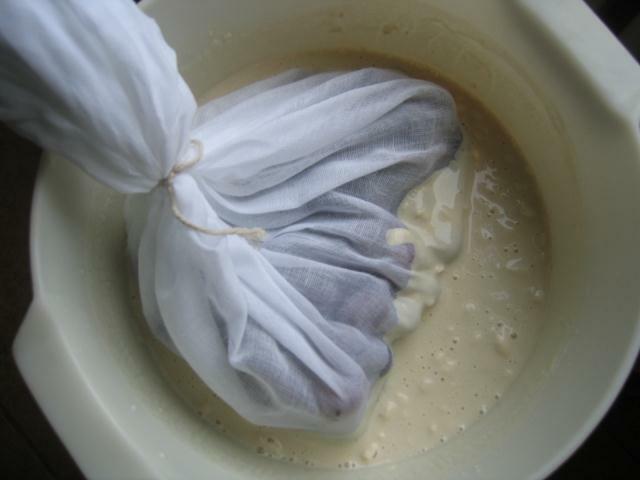 To the basic organic flour and water mix, I’ve added a muslin bag containing a bunch of red grapes, which are rich in the right types of yeast and bacteria. The recipe is from Sam and Sam Clark’s excellent Moro cookbook, so I’m expecting a sourdough with a hint of Spain….even the grapes are Spanish, although this is more down to Asda’s supply chain and good fortune than any of my planning. The starter looks a bit nervous at the moment. It will be left for two weeks, before the next feeding stage.